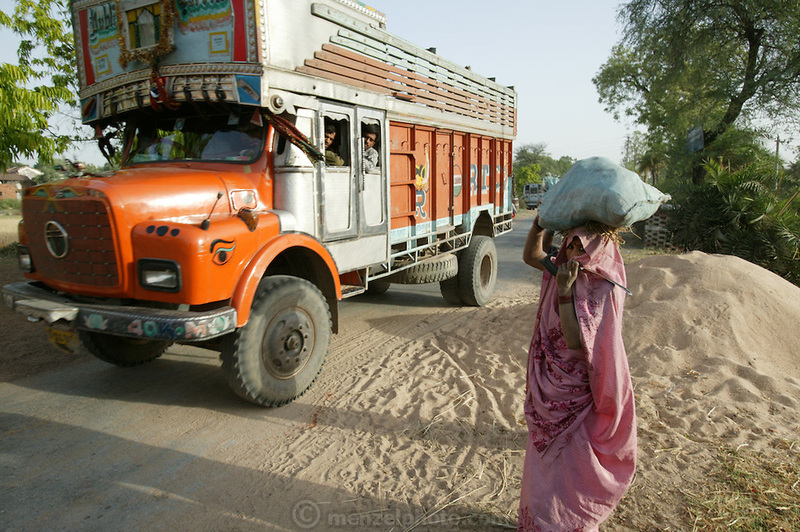 IND.MWdrv04.152.x..MIshri Yadav, 35, waits for a truck to pass before crossing the road to her home village after harvesting wheat. Her family grows one planting of wheat and then rice during the rest of the year. Mishri's family must pay half of the harvest to the owner of the land that they farm. Ahraura Village, Uttar Pradesh, India. Revisit with the family, 2004. The Yadavs were India's participants in Material World: A Global Family Portrait, 1994 (pages: 64-65), for which they took all of their possessions out of their house for a family-and-possessions-portrait. Work..